We live and work in a very open world. We share, we like, we pin and we friend. Trust is more important today than ever. Before the internet no one knew much about anything but now we know everything everyone is doing when, where, why and how. And before the internet, we had snoopers. You know who you (and they) are. It’s a little overwhelming, but can you imagine working for a “snoopervisor”? “Her excuse was that she had never seen that cell phone model before. But when she gave me back my phone, I could tell a few new text messages had been read.” Natalie was working for a snoopervisor. 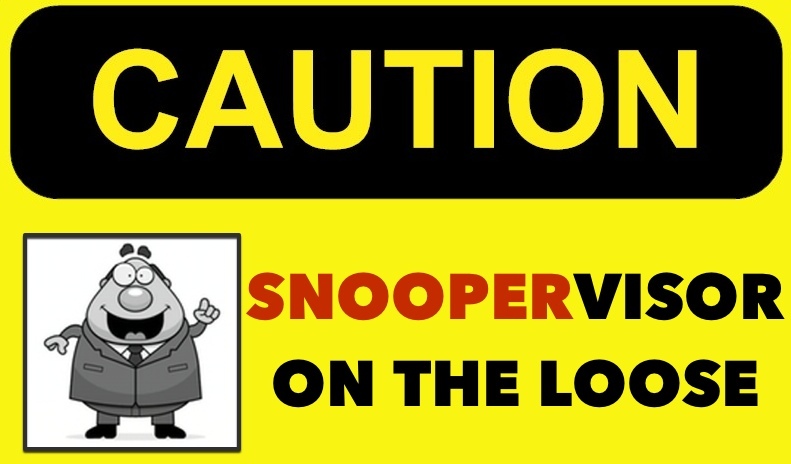 A snoopervisor is a supervisor who lurks about in a sneaking and meddlesome manner in order to spy and gain information about his/her employees. In Natalie’s case, she was working for a very small company. As a result, she had to work very closely with the office manager, Jody – sometimes too close for comfort. They had to eat breakfast and lunch together, because, Jody said, it was an office rule since there was no receptionist. Jody used that opportunity to bombard Natalie with question after question about her personal life, night school, former jobs, her boyfriend and even her pets. The snoopervisor was obsessed about knowing Natalie’s whereabouts. If she was a couple of minutes late, she would call Natalie to make sure she was parking or going up the stairs to the office. One time, Natalie says she had a terrible headache so went to her car to get an aspirin. When she was back, the snoopervisor asked Natalie where she had gone and said: “I went to look for you to the restrooms, to make sure everything was OK, but you were not there.” Thankfully Natalie had the bottle of aspirin as evidence. In all of her previous jobs, Natalie had never had any performance issues. She had always received feedback that she was dependable, responsible and a good problem solver. But in this job, even though she was excelling in her position, she felt she was being treated like a child with no independence to take decisions at work and was constantly criticized for her personal life. Her snoopervisor had no respect for personal boundaries. We never found out her motivation for snooping: was it fear of being replaced, boredom, overly controlling, motherly, perhaps? But even if she had good intentions, Natalie felt suffocated at work.. It didn’t matter that she was selected to work on an important project, a 9/80 schedule, reasonable hours or good benefits. She wanted out. As soon as an opportunity came her way, she was gone. There’s a lesson here for managers. If you don’t want to lose your talent, make sure you treat employees as adults, respect them, and give them the freedom to make decisions at work. Also, if you have been tempted to look at what your employee is doing in their personal time, stop. Getting an employee to confide in you is a process that takes time. Even if you like your employee, they may prefer not to share their life with the office and find your questions intrusive. Tell me. Do you have any snoopervisor stories? Thank you to the lovely Jaclyn Clarabut for editing my article.